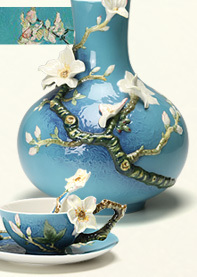 Porcelain is China's most significant invention. As a porcelain company, Franz Collection utilized the material to carry the "Great Way". Its artwork intends to interpret the perfection among Heaven, Earth and Mankind and deliver the eternal values of love for the three entities. 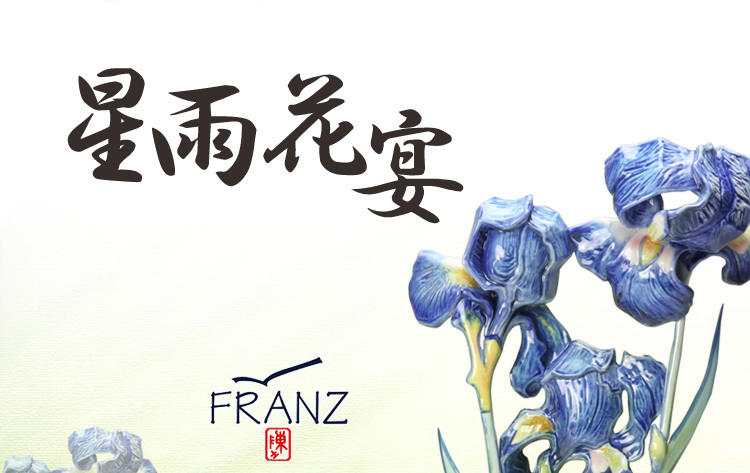 The Franz Collection's relatively young are (just over a decade) has managed to incorporate its roots in the original founding city of the Porcelain process, Jingdezhen, China. Situated on the Eastern banks of the Yangtse river our town artisans pursue their labor of love! Here the process of perfection starts as no other city in the world can claim ownership to this 1700 year old art form. Established in 2001, the Franz Collection was first recognized at the 2002 New York International Gift Fair and awarded "Best in Show". Its unique style integrating Chinese and Western aesthetics has gained a dedicated global following. The Franz Collection brand has a worldwide distribution network that has an inherent appreciation for art in a functional form with a complete understanding of the companies mission to produce functional, fusion art based on Nature. This collection is a Co-branding of Franz Collection and the Van Gogh Museum in Amsterdam. 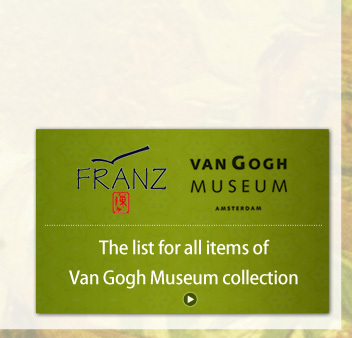 The bottom of every Franz item is embossed with the registered trademark of Franz Collection and the signatures of both designer (right side) and sculpture (left side) as well as licensed registered trademark of the Van Gogh Museum in Amsterdam.  The trademark, an icon of a seagull, represents their free creativity. The red Chinese seal shows the founder's family name. The Chinese character and the Western letters echo to each other and express fusion art in Franz style. The co-branding partnership with the Van Gogh Museum also shows the artistic conception of integrating Eastern and Western aesthetics. This Inspiring work comes from Van Gogh's painting "Sunflowers" completed in 1889. In order to welcome his good friend Gauguin's visit, Van Gogh decorated the room with bright sunflowers to express their unique friendship. Franz designer Brian Wu used the main element in the painting transforming artwork into an unparalleled piece of porcelain beauty. The designer's attention to detail is in clear evidence as one looks upon the sunflowers petals as they allow for unrestricted, organic clarity. Brian's ability to surface such thick, oil based texture with Van Gogh's passion truly reflects the artist's original intent. This inspiration comes from Van Gogh's 1890 painting "Irises". 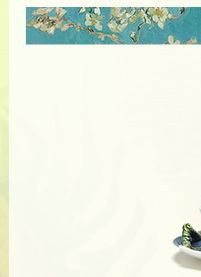 Every iris in the painting has its unique style, rich color and strong contoured lines, all expressing the artist's deep passion and the designer's unique talents. Franz designer Brian Wu used the main element in the painting to create this artwork, transforming Van Gogh's canvas into a product of nature. The details are hand-painted and layers of colors are applied to show the touch of oil painting. 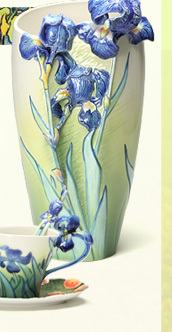 The triangle indentation in the middle adds gradation to the three-dimensional flowers so that the irises seem to blossom greely along the vase. This artwork is inspired by Van Gogh's painting "Almond Blossom" of 1890. Van Gogh's brother Theo told Van Gogh in a letter that his nephew was born and named him Vincent William. 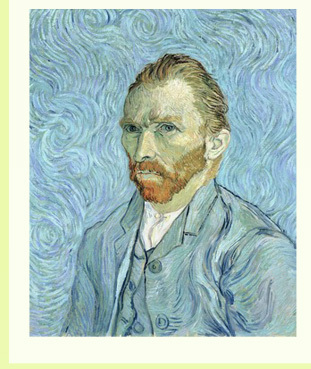 Van Gogh got so excited after finding this out that he decided to create a painting. The almond tree always blossoms in February as to announced the coming of spring and to represent the birth of a new life. 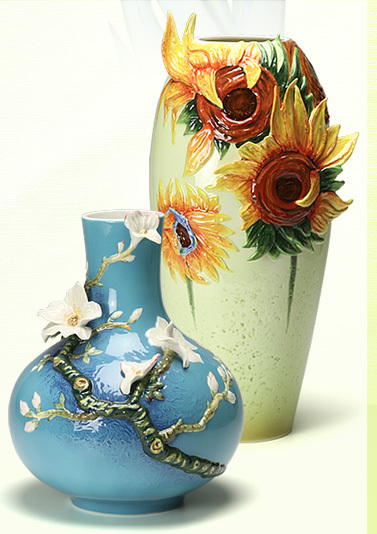 Franz designer Span Lin transformed the blue sky of Southern France onto a vase with the almond tree blossoming freely with the blue sky as a background, creating an incredibly beautiful scene. This inspiration comes from Van Gogh's 1890 painting 'Butterflies and poppies'. Van Gogh collected many Japanese paintings. This piece of artwork reveals an influence of that art. 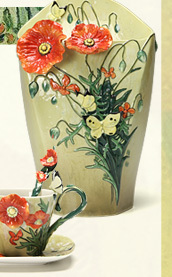 The composition of the poppies and butterflies are typical of Japanese painting. 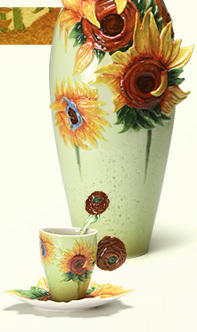 The Franz designer extracted the essence of the painting and transformed the canvas into a magnificent vase. With blossoming flowers in three dimensions and the butterflies on the vase, the artwork seems to bring out Van Gogh's strong passion. 1890 / National Gallery of Art, Washington, D.C. This inspiration comes from Van Gogh's 1890 painting 'Roses'. 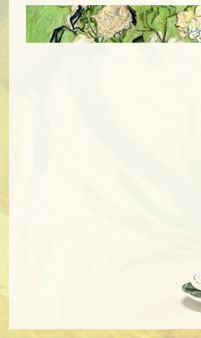 Van Gogh always loved to use plants. Though lonely and sad most of his life Van Gogh was happiest just before dying in 1890 while under the care of Dr. Gachet. This painting was done during that period. The rose is a symbol of romance and happiness. The colors used in this painting are moderate compared to his earlier paintings. 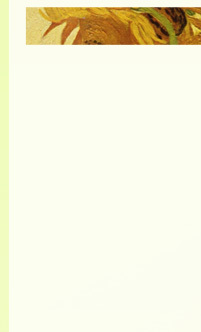 Simple white and green colors were used to show a beautiful world. 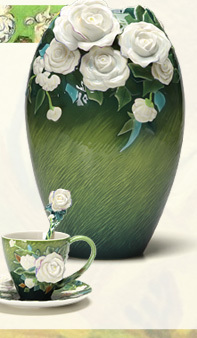 Franz designer Junnie Fu carefully transformed the warm green onto an oval vase with the white roses blossoming in the mouth as a bunch of graceful roses, depicting romantic and beautiful world.